There’s some awesome art work on public display in our neighborhood. Here are three examples. One of the most interesting places nearby is the Antique Sandwich Co., founded as a family business in 1973. The restaurant serves breakfast, lunch, and dinner, and offers a varied menu that includes granola, cinnamon rolls, sandwiches, soups, lasagna, quiche, pies, cakes, and a big selection of teas and coffees. They also host frequent musical performances. The mural pictured here graces the N. 51st Street side of the shop’s antique building. 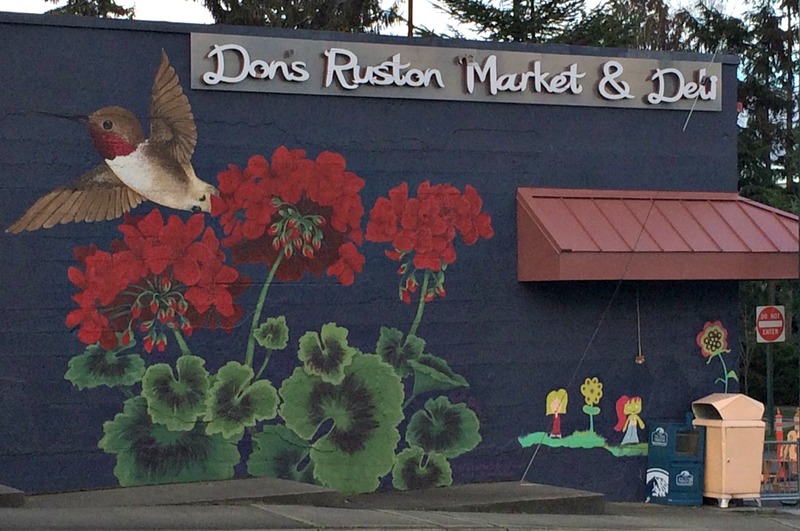 Just a few blocks down N. 51st Street from the Antique Sandwich Co. is Don’s Ruston Market and Deli. Don’s has graced its corner in the little city of Ruston for more than 30 years. It offers seasonal kayak rentals, but its main attraction is the antique soda fountain that features a lengthy list of milkshakes and sodas. For more information, check out this article from our local Tacoma newspaper, The News Tribune. 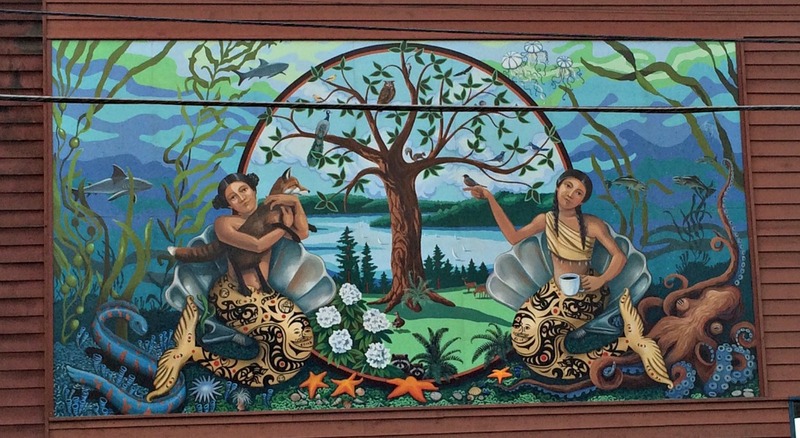 This photo shows the decorative mural on the N. 51st Street side of the store. The mural is actually much bigger (it extends further off the left side of the photo), but I couldn’t get the whole thing because a van was parked on the street. About three steep blocks down N. 51st Street from Don’s Ruston Market is the new development of Point Ruston, currently under construction. When finished, the development will include apartments, condos, restaurants, retail shops, and a movie theater. The Waterwalk is a park that stretches along the edge of Commencement Bay at Point Ruston and eventually connects to a walkway into nearby Point Defiance Park. 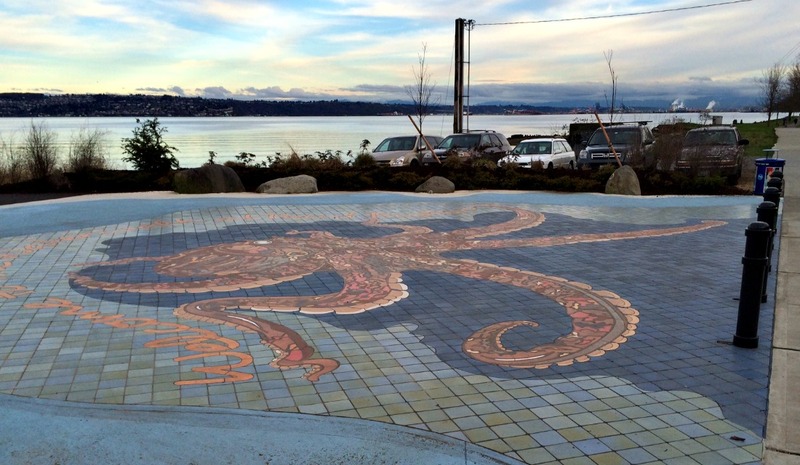 This octopus graces an entrance into the park off Ruston Way. There are other art spots along the walkway featuring fish, jellyfish, and squids. I photographed the octopus because the Giant Pacific Octopus, prolific in this area, is one of my favorite animals. That’s a neat octopus mosaic! Have you and dad tried Don’s Market & Deli.